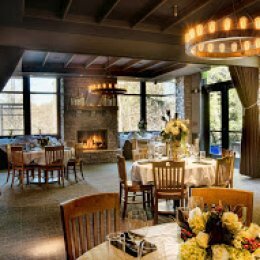 We are so pleased you are considering Ray’s at Killer Creek for your special event! With several different room options that can accommodate up to 70 guests and delicious menu selections, we know that we can offer you a truly memorable event. Hosting a group larger than 70 guests? Daytime, full restaurant buyouts are also available! Our team includes a great culinary team, as well as a highly trained service staff and a dedicated Events Manager, who will work with you every step of the way as you plan your event. If you do not see something you are looking for in our private party information, please ask. We will do everything we can to make your event special and one that guests will talk about for years to come! 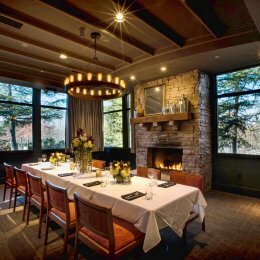 Perfect for an intimate event, the Cellar Room is a private dining space located off of the main dining room. You will feel warm and cozy thanks to the rich wood, stone hearth and glow of the fireplace. The Wine-Jordan is an excellent option for larger events up to 60 guests seated. Enjoy being surrounded by towers of fine wines and rich natural finishes. Extend the party into our private outdoor courtyard, and you'll feel transported to a beautiful garden far away from Alpharetta. 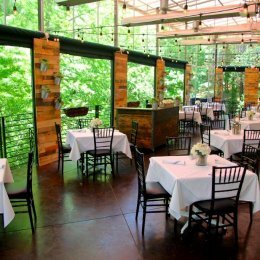 The Creek Terrace is a spacious outdoor patio surrounded by lush trees and flowers that overlooks Foe's Killer Creek and the Upper Chattahoochee Natural Forest Preserve. Your event can be set up family style, with one or two long tables, or more formally with separate table groupings.